Newsflash: The Kindle Edition is Here!!! Almost a year after the first edition of "The Resume Design Book" was initially released, the Kindle Edition is finally available exclusively through Amazon, on the Kindle Store. No detail was spared in the development of this new release. It features high-quality digital illustrations in vivid color with crisp typography, at an affordable price. The Kindle Edition allows you to read, make highlights, and take notes right on your phone, computer or favorite Kindle device. Kick-off your new resume today through the Kindle Store and Kindle Unlimited, or inspire your friends and family members to rethink their resumes with a digital gift. Cheers to making the mundane chore of resume writing into a new and exciting visual journey! Thank you all so much for the support, awesome feedback, and kind reviews up until now. I hope you, and those you share it with, enjoy it! P.S. I'd love to hear your feedback, or how I could make it better! Buy it now for just $2.99 or get it for free by signing up with Kindle Unlimited. Official Press Release: Now Available, The 2nd Edition of "The Resume Design Book"
I am proud to announce the Second Edition of "The Resume Design Book" and look forward to seeing how the recent improvements made can help college students around the world encounter the resume writing process in new ways. Since The Resume Design Book's launch this May, a tireless effort has been made to add new illustrations, bring more clarity to passages, fix rogue grammar mistakes, link instructional video content, and improve the overall quality of the book. The collection has also been re-branded. Now available for purchase are: The Resume Design Book or The Resume Design Book [Color Edition]. Both options have the same content inside, the difference being: one option is printed in gray-scale and the other in color. These are replacing the B&W Edition (now the standard option) and the Art Edition (now Color Edition). The "Free Resources" page (www.resumedesignbook.com/welcome) has been added to the digital content offered through "The Resume Design Book" by Matthew Cross. These resources are crucial for college students at all levels. Whether trying to write a first resume or updating a current resume these resources will aid in the quest to find an internship or job and continue down the right career path (and make some money)! 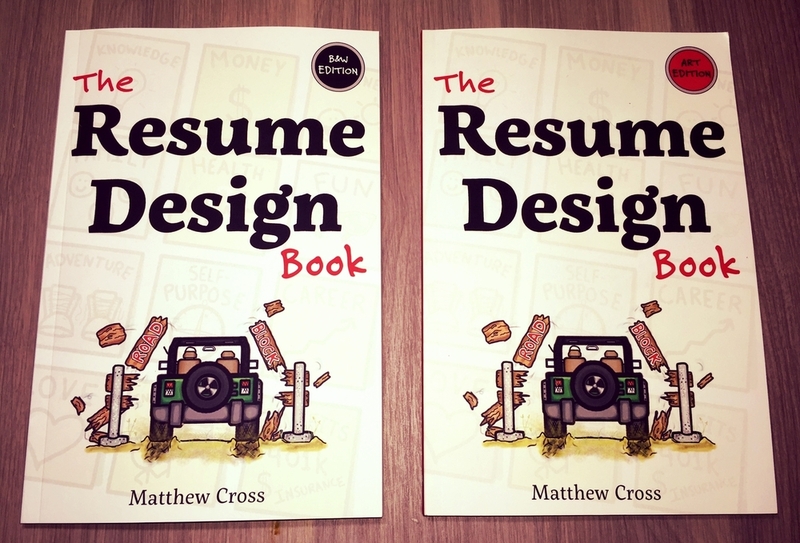 Matthew T Cross, Author of "The Resume Design Book"